How Long Can GE Keep The Lights On for Investors? Home » Investor News » How Long Can General Electric Keep the Lights on for Investors? General Electric Company (NYSE: GE) got its power turned back on this week. After plunging roughly 70 percent from its 2016 highs, GE stock surged more than 11.6 percent on Thursday, driven by strong fourth-quarter revenue. Diving straight into the numbers, GE reported 4Q revenue of $33.28 billion versus analyst expectations for $32.33 billion. Earnings, however, came up short at 17 cents per share compared to the consensus expectations for a profit of 22 cents per share. The rest of GE’s report was just as shaky. GE Power revenue plunged 25 percent during the quarter, but GE Aviation revenue rose 21 percent. Outside of the headline revenue figure, however, the biggest sentiment boost for GE investors was likely news that the company has settled with the Department of Justice. The DOJ was investigating GE for subprime mortgage violations in 2006 and 2007. The pair have agreed in principle to settle for $1.5 billion, a relatively light figure compared to the $76 billion in fines levied against Bank of America and the roughly $44 billion JPMorgan Chase had to dole out. That said, GE is far from out of the woods. New CEO Larry Culp must still continue to navigate the rough waters of GE’s turnaround. The company is saddled with more than $100 billion in debt and a number of underperforming businesses — underscoring the unwieldiness that conglomerate had become. That turnaround includes taking a hard look at those remaining businesses for potential sales and spinoffs. On the other hand, GE’s dividend cut appears to have already had an impact. After slashing its payout to a penny per share back in December, GE generated about $10 billion in cash over the quarter. The sales of its stake in oil services group Baker Hughes also contributed healthily. But despite these moves, cash flow from continuing operations dropped 8.6 percent from year-ago levels to just $6.4 billion. On the technical front, newly gained support at $10 could be tested as early as next week. Right now GE is hovering just above $10 per share after its post-earnings surge. That rally, however, was stopped short of $11 — an area of long-term technical price support for GE. Furthermore, the shares are still staring up at their 200-day moving average, which is perched in the $12 region. What’s more, this week’s buying spree has GE’s 14-day Relative Strength Index (RSI) trading firmly in overbought territory. The shares are clinging to a precarious perch above $10 per share, and any pullback could push them back into single-digit territory. 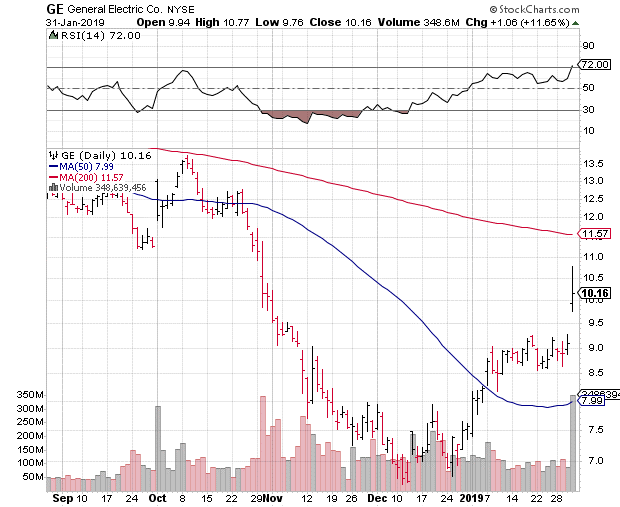 With a dividend yield of just 0.39 percent and more cuts to businesses and spending to come, it remains to be seen whether Wall Street sentiment will allow GE stock to remain in double-digit territory for long.